Well when I needed my own space I got myself a large apartment in Edenrus flats, in Arcadia. Edenrus was so beautiful, neat and orderly. There were mainly families with young children occupying it. All 2 and half bedrooms to myself. 2 garages for the carless me and the R1850 that I had to pay was a lot. I didn’t worry much about it. Arcadia was just beautiful. The complex had a sparkling swimming pool. I still kick myself for not buying that unit. All of a sudden my work was a 5 minute walk and a number of shopping malls. But when it comes to shopping, it was still not as posh as Sunnypark. I still had to make some shopping trips to Sunnyside. A girl has to get a dose of shoe shopping every once in a while. Apart from that, I loved banking and just walking in Arcadia. 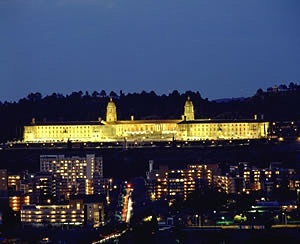 The Union Buildings was just a few minutes’ walk from my flat. But other than visiting this beautiful Presidential building for its beauty, I never attended any of the mass activities held. I must say, much as I am a social being, I hate being squeezed in between hyper active individuals. So I missed on seeing the president and Members of Parliament on their occasional functions and speeches in the Union Buildings. Arcadia suburb still has a special place in my heart, I must add.